An original news clipping from the St. Cloud Times showing Erik working on the Landis brand sewing machine. Hello Friends! Welcome to my Blog “Words of Wisdom from the Mugger”. During the festival, one of the vendors in our neighborhood publishes a weekly newsletter with stories, updates, puzzles and such. For a number of years, I have contributed a small column of wisdom and inspirational words called “Words of Wisdom from the Mugger”. I think it is a fitting name for this blog. I started doing leather work as a boy scout. It was a hobby of mine since I was 10 years old. I have also been attending the Minnesota Ren fest most of my life. I loved going into the leather shops to see what everyone was making and to look for new items and Ideas. One of the shops that I really liked was Thistle Leather, owned by the late Harold “Mac” McMillen. 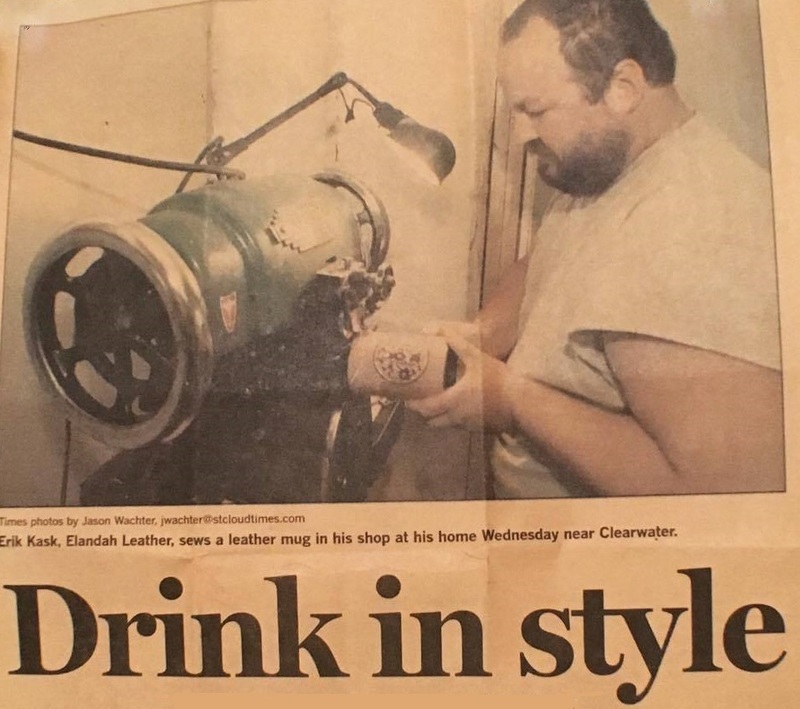 Master Mac was the original maker of the leather mug at the festival. I thought it was crazy that someone could actually make a cup out of leather that wouldn’t leak. For the life of me, I couldn’t figure out how he did it. Jump ahead many years… One day, I learned that a very good friend and co-worker of mine, Becky (She and her husband, Jay, have been helping us out at the festival every year since we opened. I don’t know what I would do without them) is the cousin of Mac’s wife Trish. So through Becky, I get an invitation to spend an afternoon with Mac in his shop. Poor man, I think I asked him a thousand questions. He gave me a lot of lessons and taught me tricks about leather working. One of the most interesting things in his shop was this old, giant sewing machine. This machine was built back in the 50s and stands about 5 feet high. I bet we spent an hour at this machine. He taught me how to use it, how to thread it and how to take care of it. He joked that he could take two people and turn them into siamese twins with this sewing machine. A week later, Master Mac passed away. Two months after, I received a phone call from the widow Trish. She was interested in continuing Mac’s business, but was deathly afraid of the sewing machine. She asked if I would mind stopping by once in awhile to sew mugs for her. At the time, I was a high school teacher at Kimball and drove past her house each day, so I agreed. This went on for about a year. But slowly, she started to develop Carpal Tunnel in her wrists and they would hurt her. So she again asked me if I would mind doing a couple of other steps in the process in order to give her wrists a break. Of course I was happy to. Finally, after 3 years, Trish decided that she just couldn’t do it anymore and asked me if I would be interested in buying her out. I wrote up an offer for her to buy all of the equipment and the embossing plates. In that offer I also agreed to pay her a royalty of $1 per mug for the use of Mac’s embossing plates and the use of the name Thistle Leather. ( I will be making mug #11,000 this fall) After some discussion, Trish didn’t feel right about giving up the name of Thistle Leather and Mac’s art. She thought it would be better if we just let the name and art expire with him. So we decided to eliminate the royalty and that I would just buy the equipment and tooling from her. I started doing some small single weekend shows. But when I was accepted as a vendor at the Minnesota Ren Fest, I quit teaching and started doing leatherwork full time. That was in 2004 and I have been self employed ever since. This will be my 14th year at the Minnesota Ren Fest.